Nilotic peoples have lived in the area of South Sudan since before the 10th century. Migrations of many ethnic groups into the region continued during the following centuries. In the late 19th century, Egypt claimed part of the region, establishing the province of Equatoria. By the end of the 19th century the region was under joint British-Egyptian control. The region of South Sudan, as part of Sudan, became independent in 1956. Two civil wars dominated the following decades: the first from 1955 to 1972, and the second from 1983 to 2005. A factor in both wars was the perceived marginalisation of the southern population by the northern-dominated government. The ethnic mix in South Sudan is dominated by Dinka, Nuer and other Nilotic peoples, who are traditionally Christian or animist, distinct from the dominantly Arab and Muslim identity of present day Sudan to the north. South Sudan was designated an autonomous region of Sudan in 1972, with an autonomous government after a peace agreement in 2005. A referendum led to the creation of the Republic of South Sudan as an independent country in 2011. Conflict has continued since independence, both internally and with Sudan, in part over disputed oil-rich land and conditions of use of oil transport infrastructure. A civil war began in 2013 and has caused widespread violence and deaths and the creation of millions of internally displaced people or refugees. South Sudan’s economy and infrastructure are poorly developed, having suffered decades of civil war. Livelihood activities are dominated by agriculture, particularly traditional stock-raising. The country has significant mineral and oil resources. Oil is the main source of export income, but development of the industry has been complicated by disputes with Sudan, particularly as exports rely on pipelines and other infrastructure in Sudan. Timber is also exported. South Sudan has relatively high seasonal rainfall, especially in the south, and a number of major rivers flow through the country, including the While Nile. However, water resources are unevenly distributed, water supply infrastructure is poorly developed and access to improved water supplies is low. Groundwater is the main source of drinking water for most of the population, but there has been relatively little investigation of groundwater resources in the country. South Sudan. Map developed from USGS GTOPOPO30; GADM global administrative areas; and UN Revision of World Urbanization Prospects. For more information on the map development and datasets see the geography resource page. 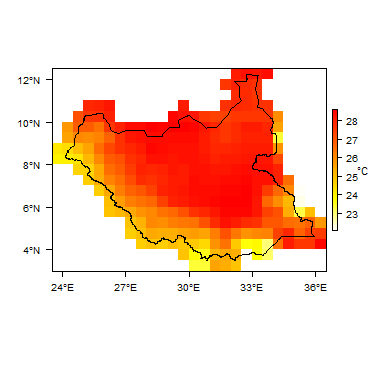 More information on average rainfall and temperature for each of the climate zones in South Sudan can be seen at the South Sudan climate page. Major surface water features of South Sudan. Map developed from World Wildlife Fund HydroSHEDS; Digital Chart of the World drainage; and FAO Inland Water Bodies. For more information on the map development and datasets see the surface water resource page. 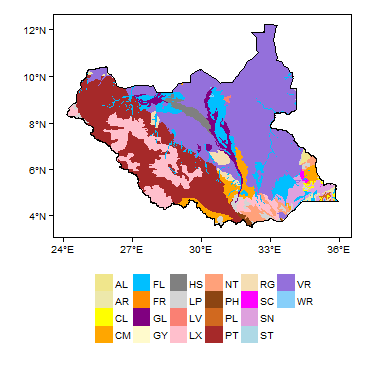 Soil Map of South Sudan, from the European Commission Joint Research Centre: European Soil Portal. For more information on the map see the soil resource page. 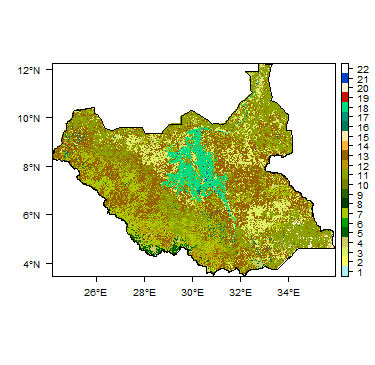 Land Cover Map of South Sudan, from the European Space Agency GlobCover 2.3, 2009. For more information on the map see the land cover resource page. The geology map shows a simplified overview of the geology at a national scale (see the Geology resource page for more details). More information is available in the UN report (1988), and in other references listed below. Some of the information in the Hydrogeology of Sudan page may also be useful. Geology of South Sudan at 1:5 million scale. Based on map described by Persits et al. 2002/Furon and Lombard 1964. For more information on the map development and datasets see the geology resource page. South Sudan’s geology ranges from Precambrian crystalline basement rocks to Quaternary unconsolidated alluvial deposits. Significant periods of erosion during the Paleozoic and Mesozoic removed the majority of sedimentary cover deposited on the crystalline basement during these times. Tectonic movements of the Rift System during the Paleogene and Neogene Periods (middle to upper Tertiary) led to the formation of large structural basins across southern Sudan and South Sudan. These are generally north-west to south-east trending, perpendicular to the Central African Shear Zone in central Sudan. The Muglad Basin is the main rift basin in South Sudan, covering an area of approximately 120,000 km2 across South Sudan and southern Sudan. This basin, along with others in the rift system, received thick fluvial and lacustral deposits during the Pliocene-Pleistocene (late Tertiary to early Quaternary Period). These deposits constitute the Umm Ruwaba Formation (see below). The Muglad Basin contains a number of hydrocarbon reserves which are exploited for export and domestic consumption. 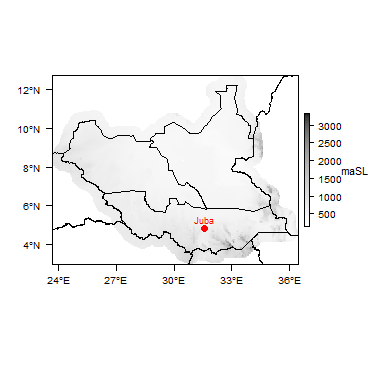 Volcanic activity during the late Neogene and early Quaternary Periods produced the volcanic deposits that outcrop in the south-east of South Sudan. Nile alluvium, wadi fill and swamp deposits Quaternary These are widely deposited along the Nile River and its tributaries. Ancient and recent terrace deposits consist of well-sorted silts and clays with occasional sandy strata and can be up to 60m thick. Alluvial fill consists of medium to coarse, poorly-sorted sands with gravel and lenses of clay in places. Clays and silts up to 30-50m thick can be found around smaller tributaries and in deltaic environments. Um Ruwaba Formation Late Tertiary to Quaternary Unconsolidated superficial sediments (sands, gravels, clays) with little stratification. Pebble layers can occur at the base where it is in contact with the basement. The Umm Ruwaba contains lenticular sand and clay units which vary significantly vertically and horizontally. Thickness varies depending on position within the basin; minimum thickness is around 50m at the edge of the basin; maximum thickness is around 1400m along the main axis of the basin. The Umm Ruwaba is thought to overlie older Tertiary and Cretaceous deposits, which may reach a maximum thickness of around 10,000 m.
Nubian Sandstone Formation Upper Jurassic to Lower Cenozoic (mainly Cretaceous) The Nubian Sandstone extends from Sudan into northern South Sudan and comprises largely horizontal or gently dipping, well stratified sandstones with layers of conglomerate and siltstone (UN 1988). It is generally overlain by unconsolidated sediments of the Um Ruwaba Formation, but the thickness of these deposits varies spatially (see Um Ruwaba description above). It is possible that the exposed outcrop of Nubian Sandstone in the north west of the country is also overlain by unconsolidated deposits, but the thickness and extent of these is not well documented. Major faults are recognised in the Nubian Sandstone, sometimes displacing more than 2 km of sedimentary rocks. Precambrian Mainly undifferentiated basement with granitic intrusions, particularly in the north west. Rocks are heavily folded and faulted; NE-SW and NW-SE fractures are common. More information on the hydrogeology of South Sudan is available in the report United Nations (1988), which covers South Sudan and Sudan (see also References section, below). Some of the information in the Hydrogeology of Sudan page may also be useful. Low to High Productivity These unconsolidated sedimentary deposits consist of alluvial sands, silts, gravels and clays. Aquifer properties are variable, depending largely on lithology, but where the alluvium is dominated by coarser grained deposits, transmissivity can be high. Aquifers are usually unconfined with a shallow water table (<15mbgl). In the Sudd region groundwater levels are often above the land surface forming large swamp (wetland) areas. Groundwater flow patterns usually follow surface water features. Estimates of transmissivity and storage are given in the UN report (1988) of 200-1500 m2/d and 0.13-0.25, respectively. Collapsing sands can be a significant problem for drilling in this formation, and boreholes can become heavily silted if not installed and constructed appropriately. See Drilling in South Sudan Case Study for further information. Water quality is usually good. Aquifers receive direct recharge from rainfall during the wet season, however this can be restricted where thick clay-rich soils (vertisols – see map above) are present. Aquifers may receive recharge from rivers during periods of high flow, but aquifers may discharge to rivers during the dry season. Evaporation is high, particularly in the large swamp/wetland areas in the Sudd basin in the north. Low to Moderate Productivity The Umm Ruwaba Formation forms an unconsolidated aquifer that covers a large area, and is generally of low to moderate productivity. The properties of the aquifer vary depending largely on lithology, with lenticular sand and pebble horizons being the most productive. The aquifer can be unconfined, or locally semi-confined where permeable layers occur below clay strata at depth (UN 1988). Aquifer thickness may be several hundreds of metres but boreholes are typically drilled to depths of <250m. Collapsing sands can be a significant problem for drilling in this formation, and boreholes can become heavily silted if not installed and constructed appropriately. See Drilling in South Sudan Case Study for further information. The aquifer is used mostly for small domestic supplies and livestock watering (UN 1988). Water quality is usually good, but high salinity can be an issue, particularly where hydraulic gradients are low and stagnation occurs. Recharge is dominantly from rainfall infiltration, and is relatively small. Low to High Productivity The Nubian Sandstone Formation is a major regional aquifer (see the Hydrogeology of Sudan page for more detail). In South Sudan it is largely overlain by unconsolidated deposits, which vary in thickness (see above). The outcrop mapped in the north west of the country may also be overlain by unconsolidated deposits, but the nature and thickness of these deposits is not known. Low Productivity Groundwater occurs in fractures and/or in shallow weathered zones in Precambrian bedrock, where permeability has been increased. 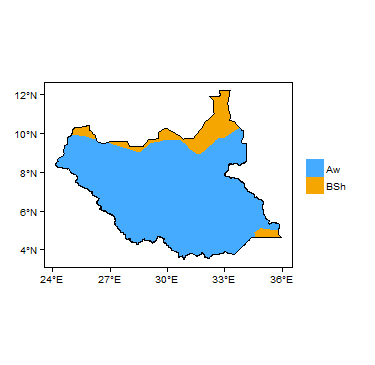 These aquifer zones are typically between 5 m and 20 m thick, but can be thicker – logs from boreholes drilled into granitic basement rocks close to Juba show a weathering profile up to 100m thick (Groundwater Relief). Water table depths range from 4 m to 60 m depth, and groundwater is typically unconfined. Abstraction boreholes range from 10 m to 70 m, and borehole yields are generally low. The fractured/weathered aquifers have low storage potential and do not contain large amounts of groundwater. Recharge is variable depending on rainfall and surface runoff. References with more information on the geology and hydrogeology of South Sudan can be accessed through the Africa Groundwater Literature Archive. There may also be information on South Sudan in older literature relating to Sudan in the Africa Groundwater Literature Archive. African Development Bank Group. 2013. South Sudan: An Infrastructure Action Plan. A Program for Sustained Strong Economic Growth. Shahin, M. 1985. 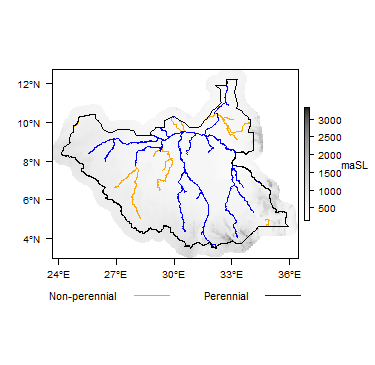 Hydrology of the Nile Basin, Elsevier. Worrell GA. 1957. A simple introduction to the geology of the Sudan. Sudan Notes and Records, Vol. 38, pp 2-9. University of Khartoum. Chapter 9: Water Supply and Sanitation. Burrows, G., Mannix, N., Sir, B., Krom, T. 2016. 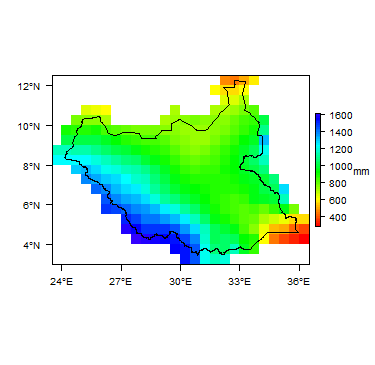 Bentiu POC Hydrogeological Assessment. Groundwater Relief Report. Burrows, G., Krom, T., Marsili, A., Michel, F. 2014. Hydrogeological Assessment of the Maban Aquifer. Hydrogeologists without Borders (Groundwater Relief) Report. Burrows, G., Odero, D., Wong, H. 2014. PoC3 Camp, Juba, South Sudan – hydrogeological desk study. Hydrogeologists without Borders (Groundwater Relief) Report. United Nations. 1988. Groundwater in North and West Africa: Sudan. United Nations Department of Technical Cooperation for Development and Economic Commission for Africa/Natural Resources/Water Series No. 18, ST/TCD/5. This page was last modified on 19 March 2019, at 11:05.